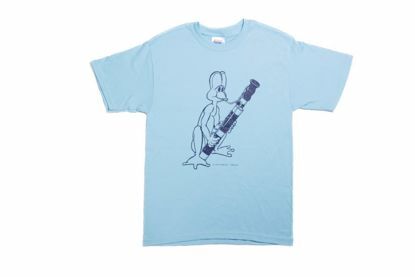 Blue t-shirt, 50/50 blend, with our trademark, "Elmer," the bassoon-playing frog. Very reasonably priced! Available in Adult (Men's) and Children's sizes. 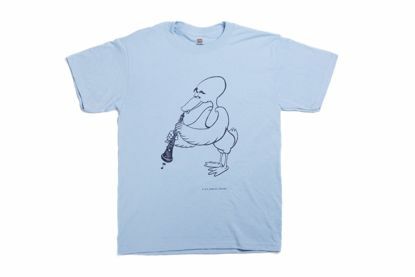 Blue t-shirt, 50/50 blend, with our trademark, "Esmerelda," the oboe-playing duck. Very reasonably priced! Available in Adult (Men's) and Children's sizes. 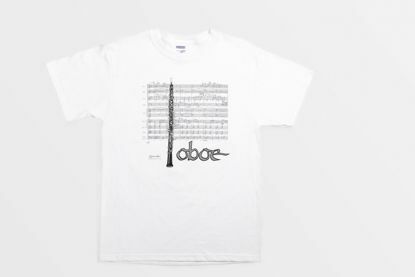 White t-shirt, 50/50 blend, with an oboe across a musical score background.